As you may have already heard, Greg Lake–one-third of the legendary seventies prog-rock band Emerson, Lake & Palmer–died of cancer yesterday at the age of 69. I was a big ELP fan back in the day. Actually, I was mostly a big Brain Salad Surgery fan back in the day, that day being 1973. I didn’t own a lot of other ELP albums, mainly because I was too busy buying albums with electric guitars on them. ELP wasn’t a guitar band. Lake was the singer-bassist and producer, joined by drummer Carl Palmer and keyboardist Keith Emerson, who passed away last year at 71. Even without the cranked six-string action I craved–and found on other ’73 discs like Montrose, Tyranny and Mutation, and Tres Hombres–I found a lot to like in the British trio’s classical stylings and advanced musicianship. And I’m pretty sure the amazing cover art by H.R. 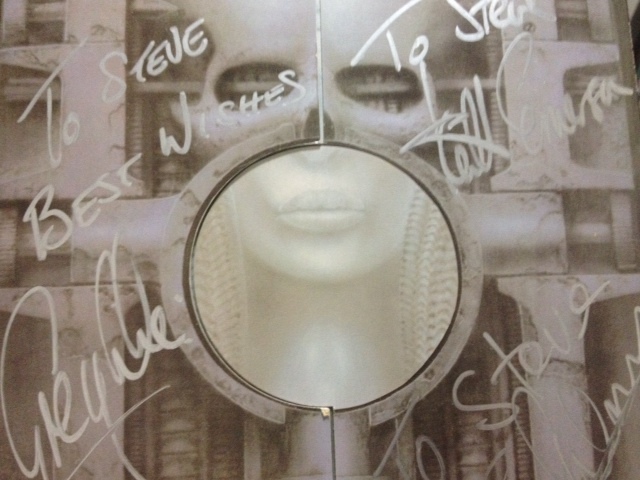 Giger on Brain Salad Surgery helped win me over as well. In 1992 ELP released its first album since the seventies, Black Moon, and since record labels had money back then, I got flown out to Montreal for one night to interview them–or Greg Lake, to be exact–at Olympic Stadium, where they’d famously performed in their heyday. At one point in the interview I asked Lake if he could pinpoint what it was about his band that attracted their diehard fans, and he had a pretty simple answer.